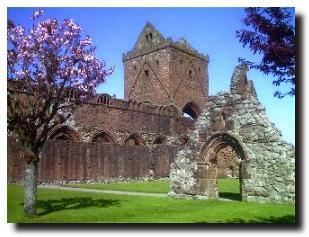 South of the town of Dumfries and near the coast of the Solway Firth, Sweetheart Abbey was founded in 1273 by Lady Devorgilla of Galloway, in memory of her late husband, John Balliol. When she died in 1289, her body was laid to rest before the high altar and a casket containing her husband's embalmed heart was placed beside her. The Cistercian monks chose the name "Dulce Cor" or Sweetheart, in her memory. The Abbey was not Devorgilla's only act of charity - she endowed Balliol College in Oxford in 1282. Her son was John Balliol who became king of Scotland at the behest of King Edward I - and had his regalia stripped from him by Edward when he didn't toe the line. Devorgilla herself was descended from the royal house of Dunkeld. Edward I, the "Hammer of the Scots" stayed at the abbey in 1300 but unlike some of the other abbeys in the Borders, it was relatively unharmed by English invasions. The abbey was later under the patronage of Archibald Douglas who lived at Threave Castle and was known as "Archibald the Grim". The Douglas coat of arms can still be seen on the arched doorway to the west cloister. It was the Reformation which saw the demise of the building as a place of worship in 1608 when the last of the monks were forced to leave. The building would have been destroyed at that time but Lord Maxwell, the local landowner, refused to obey the order of the Lords of the Congregation. 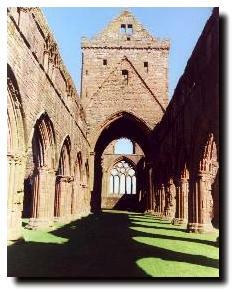 However, the cloister was later used as a quarry for some time and the church eventually lost its roof. Fortunately, some of the locals acquired the building in the 19th century and it was not allowed to deteriorate further. Despite the ravages of time, a substantial part of this impressive abbey is still standing, including the nave, the choir, bell tower and the stonework of the great east window. There is an effigy of Devorgilla, holding the casket with the embalmed heart of her husband. 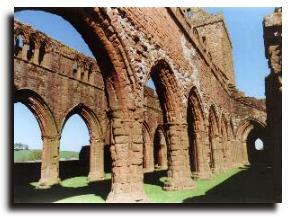 Sweetheart Abbey has the most complete precinct walls surviving round a Scottish medieval monastery.